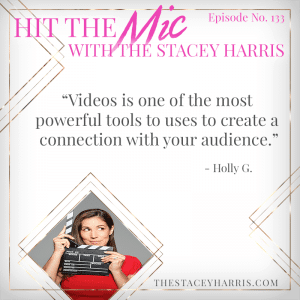 Adding Video to Your Brand with Holly G.
Scared of video? You’re not alone. I’m sitting down with Holly G of HollyGStuidos.com to find out how to get past that NOW. She shares some great insights on getting past the fear, and how to make your video efforts better! Holly started her freelance career in 2008 as a Cinematographer, Producer, and Editor working with big industry names including the Sundance Channel, Sony Music, Nick.com, HBO, Bono, Big Time Rush, Forest Whitaker and many others. Her skills and experience run the full gamut from Producing and Directing to Shooting and Editing, and she has translated those skills into a range of educational courses and services to support entrepreneurs in their quest for video stardom. Holly believes that video isn’t “just” video; it’s your ticket to a more personalized brand, your secret weapon to cut through the static in your market, and your best opportunity to have a meaningful conversation with your clients and customers (that converts to dolla-dolla bills! ).